Mirasol is pleased to announce that a National Instrument 43-101 Technical Report for an initial mineral resource estimate has been filed on SEDAR with a report date of January 23, 2015, (the “Virginia Mineral Resource Report”) for the 100% owned Virginia Silver Project located in the Santa Cruz Province, Argentina (Figure 1). This report presents a conceptual open-pit constrained mineral resource estimate exclusively focused on the vein/breccia high-grade component of the mineralization previously reported (see news release February 7th 2013). Initial metallurgical testwork on this material indicated favourable silver recovery from conventional technologies. The mineral resource estimate (Table 1) tabulates Indicated material totalling 11.9 million ounces Ag at 310 g/t, and Inferred material totalling 3.1 million ounces Ag at 207 g/t, contained within seven outcropping veins of high grade silver mineralization based on a silver price of US$20 per ounce and a 63 g/t Ag cut-off grade. Note: Mineral resources which are not Mineral reserves do not have demonstrated economic viability. Inferred Mineral Resources have a high degree of uncertainty as to their existence, and great uncertainty as to their economic and legal feasibility. It cannot be assumed that all or any part of an Inferred Mineral Resource will ever be upgraded to a higher category. Tonnes, grade values, and contained silver metal quantities may differ due to rounding. The mineral resources shown in Table 1 were estimated with MineSight® software and constrained by conceptual Lerchs-Grossmann pits using parameters listed in Table 2, at a silver price of US$20 and 63 g/t Ag cut-off. Mirasol announced the discovery of the outcropping high-grade Virginia silver mineralization and the subsequent surface sampling and drill testing programmes in a series of news releases between January 2010 and June 2012 (please refer to the Mirasol website www.mirasolresources.com). In February 2013, Mirasol reported positive preliminary metallurgical results for the vein breccia mineralization with recoveries of between 75 and 81% from industry-standard technologies. On 21st February 2014, the company filed a comprehensive NI 43-101 exploration report summarising the drilling and preliminary metallurgical testwork. 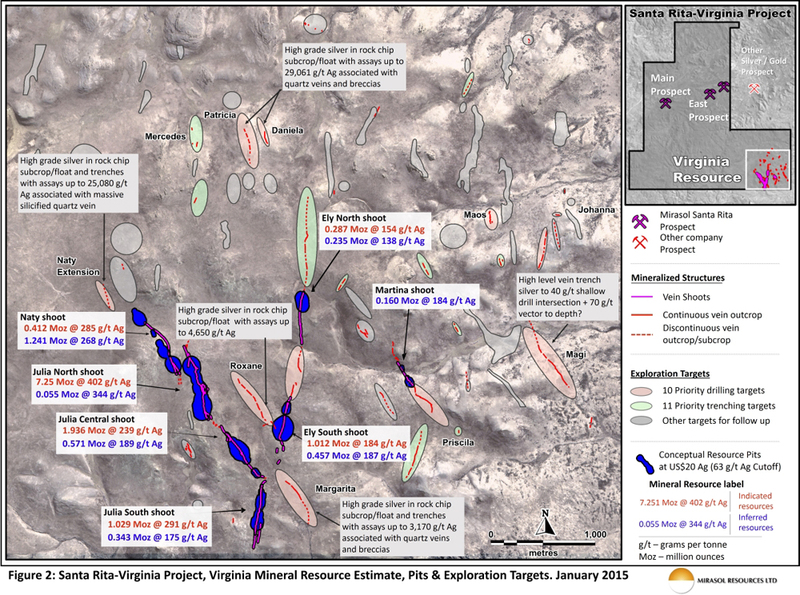 This report also highlighted 21 new exploration targets at Virginia (Figure 2) positioned adjacent to the seven shoots previously tested by the systematic drilling, which suggested the potential for expansion to the known mineralization. 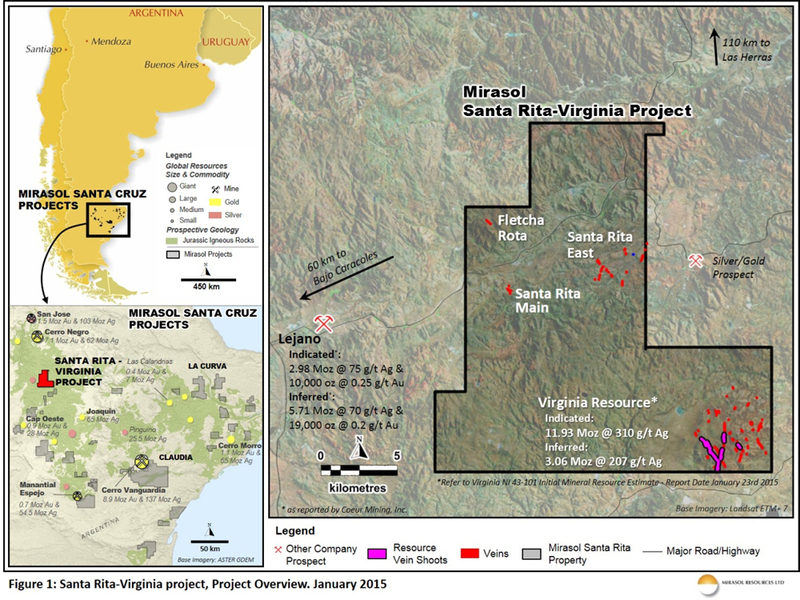 Since late 2013, Mirasol has not conducted further exploration at the Virginia – Santa Rita project. The Virginia mineral resource estimate considered all drilling and surface channel sampling for the seven shoots. All drilling and channel sampling used in the mineral resource estimate was completed prior to August 2012. The Virginia mineralization is interpreted to be an example of a silver-dominant bonanza – style low – sulphidation epithermal deposit associated with a rhyolitic dome volcanic field. The seven silver deposits (see news release June 26, 2012) considered in this mineral resource estimate are mineralized from surface, and are highly oxidized to the lower limit of drilling, at 150 m vertical depth. The primary silver mineral in the vein/breccia is acanthite, a silver sulphide favourable to conventional metallurgical processes. The deposits are characterized by a high-grade core of quartz + iron oxide-bearing vein / breccia structures which host silver mineralization and yield drill core intersections in the range of 1.5 to 5.3 m true-width containing 100’s to 1,000’s of g/t Ag. The central core of the veins has a broad halo exceeding 30 g/t Ag. True-widths of the mineralized zone, at a cut-off of 30 g/t Ag, commonly attains widths of 10 to 20 m, and can reach as much as 79 m wide. The seven mineralized bodies are in some cases open at-depth and along-strike. While silver grades in some mineralized bodies appear to pinch out or decrease down-dip, there has been no exploration drilling below approximately 160 m to test for additional shoots at depth. Mirasol is encouraged by the delineation of this initial silver mineral resource at the Virginia Project. Mirasol’s exploration drilling to August 2012 at Virginia has focused on testing outcropping shoots to relatively shallow depths. Mirasol has also identified a series of new untested targets, some with high-grade rock chip and trench silver assays adjacent to areas of current mineral resources which warrant further exploration. Mirasol believes the high-grade outcrops, favourable metallurgy and the potential use of open-pit mining methods position this mineral resource as a “building block” for further exploration in this under-explored district. Discovery of new mineralization adjacent to, or at-depth beneath the current mineral resources could positively impact this project. Mirasol recognizes Virginia is part of a new precious metal district, with untested veins identified within Mirasol’s claims at the Santa Rita prospect and an initial silver mineral resource on adjacent competitor claims. 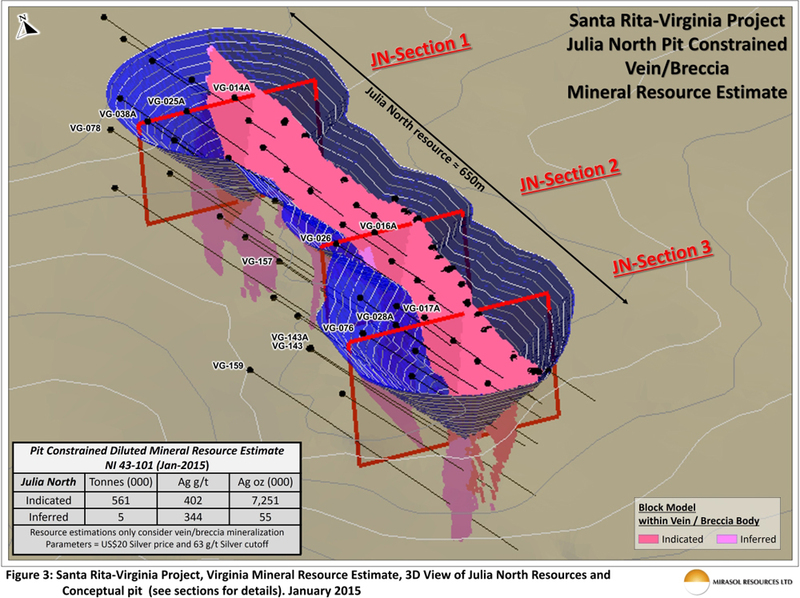 Mirasol Resources is not presently planning to undertake further exploration in the Virginia / Santa Rita claims and is actively seeking a joint venture partner to advance this project. Additional Technical Information on the Virginia initial Resource Modelling. The Virginia Mineral Resource Report was prepared following NI 43-101 guidelines and in accordance with CIMM Standards on Mineral Resources and Reserves: Definitions and Guidelines (CIM2010) by independent mineral resource consultants Mr. Mike Lechner, President of Resource Modeling Inc. located in Stites, Idaho, USA and Mr. Donald Earnest, President of Resource Evaluation Inc. located in Tucson Arizona. Mineral resources for the Virginia Project were estimated using MineSight®, an industry standard software application. The resource modelling utilised silver assay data from 194 core drill holes and 191 surface saw cut channel samples, disregarding drill holes or partial holes that were considered by the independent consultants to have low core recovery. This only impacted holes that Mirasol had previously identified as having problematic recovery, and had been re-drilled with twinned holes (See news release 19 April 2011). The vein / breccia bodies (Figures 3 & 4) were modelled as three-dimensional wireframes constructed by Mirasol using geological observations from core logging, augmented by silver assay results. Block grades were estimated within the wireframes using a three-pass inverse distance cubed (id3) methodology. Silver grades were also estimated within the halo zone and a 1 m dilution rind surrounding the vein wireframes. The mineral resource summarized in Table 1 did not include any silver mineralization in the lower-grade halo zone surrounding the vein/breccia, except for the inclusion of a 1 m mining dilution rind around the bodies. Initial metallurgical studies based upon a composite sample of mineralised halo material indicated a low silver recovery of 22%. Further metallurgical testwork is needed to determine if this can be improved to a point where the halo mineralization could be considered in subsequent mineral resource estimates. Conceptual Lerchs-Grossmann open pits were generated for each of the seven deposits with MineSight® software using the input parameters summarized in Table 2. Conservative pit slope angles of 45° were used to develop the conceptual Virginia pits; however, higher-angle pit slopes are employed at operating vein mines in Santa Cruz province. Detailed geotechnical studies would be required at Virginia to determine if the pit-slope angles could be steepened to reduce the strip ratio and increase the mineral resource tonnage. 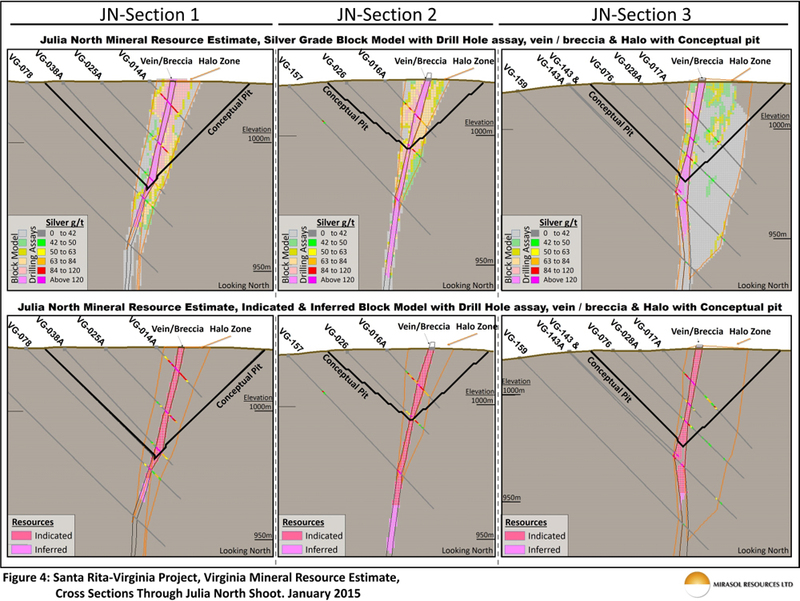 As a complement to the Virginia Mineral Resource Report, additional plans, sections and a table of drill hole information has been generated by Mirasol from the mineral resource models. This additional information, along with copies of the NI 43-101 exploration report and the Virginia Resource Report have been posted on the Mirasol’s website, www.mirasolresources.com. The mineral resource information contained in this news release has been summarised from the Virginia Mineral Resource Report prepared by Mr. Lechner and Mr. Earnest. Messers Lechner and Earnest are independent mineral resource consultants and are Qualified Persons under NI 43 -101 whom have reviewed and approved the mineral resource information in this release. The mineral resource and exploration content of this news release has been summarised from the Virginia Mineral Resource Report and other sources referenced in this news release by Stephen Nano, President and CEO of Mirasol Resources. Mr. Nano has approved the technical content of this news release and is a Qualified Person under NI 43 -101. Exploration at the Virginia Projects was supervised by Stephen C. Nano, then the Vice President of Exploration; Timothy Heenan, Exploration Manager; and Paul Lhotka, the former Principal Geologist who is the Qualified Person under NI 43-101 for the surface exploration and drilling used in the mineral resource estimate. All technical information for the Virginia project was obtained and reported under a formal quality assurance and quality control (QA/QC) program. Drill core, rock channel and rock chip samples were collected under the supervision of Company geologists in accordance with standard industry practice. Samples were dispatched via commercial transport to an ISO 9001:2000-accredited laboratory in Argentina for analysis. Results of this exploration program have been audited by an independent geochemist to confirm the Company’s QA/QC process/procedures and laboratory performance met required standards.